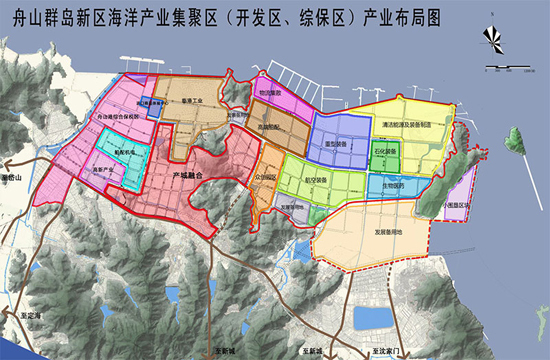 The Marine Industry Cluster Area of Zhoushan Archipelago New Area (Zhoushan High Tech Industrial Zone) is a provincial economic development zone as well as a provincial High-tech Entrepreneurship Park. It has a land area of 24 square kilometers and a sea area of 25 square km. It mainly focuses on manufacturing of high-end port-surrounding equipment, green petrochemical equipment, high-end marine equipment, aeronautic equipment and auto parts, as well as marine electronic information and new marine resources and materials.